Now’s the time to buy the Long Island Gardening Calendar, a perfect gift or stocking stuffer for the passionate gardeners in your life. 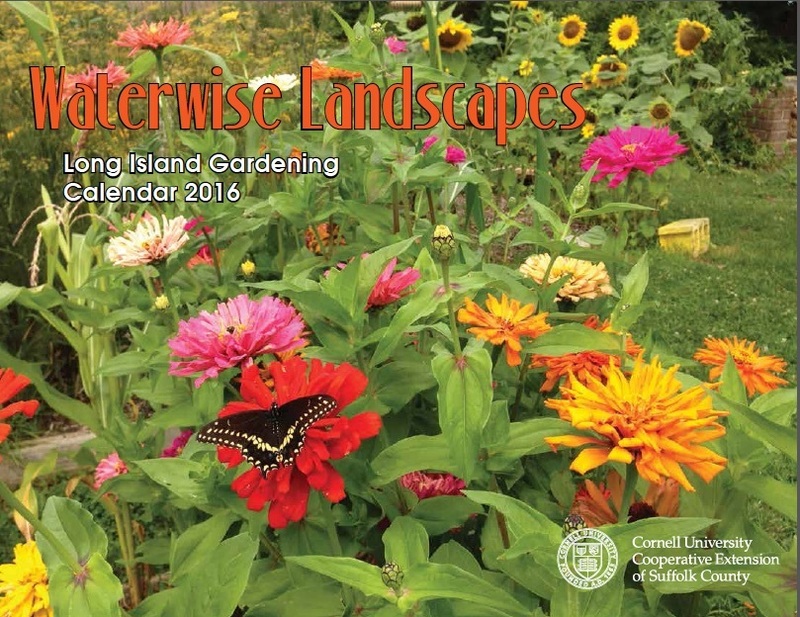 The theme for our 2016 calendar is “Waterwise Landscapes,” and it is filled with sustainable gardening tips and beautiful photographs every month. Be inspired by the many landscape and gardening choices we can make to protect Long Island estuaries and water supplies. This high-quality calendar features information on drought-tolerant plants, correct use of mulch, drip irrigation, rain barrels, healthy soil, rain gardens, green roofs, and more, including a resource page about local and national organizations that focus on native plants and sustainable horticulture. Purchase calendars at the front desk at CCE Suffolk, 423 Griffing Avenue in Riverhead for $7 each; or use this order form to have them mailed to you for $9 each to cover their cost with postage. Buy your calendars soon while supplies last! This entry was posted in Long Island gardening, Sustainable landscapes, Waterwise gardening and tagged drip irrigation, drought-tolerant plants, green roofs, irrigation, Long Island gardening, mulch, Native plants, rain barrels, rain gardens on December 4, 2015 by Robin Simmen.